The Finn Financial Group prides itself on helping industry professionals and clients better understand the nuances of structured settlements and the related products and services we offer. To learn more, click on your preferred area of interest. We offer a collection of video testimonials from many powerful Members of Congress, nationally recognized attorneys and others familiar with the benefits of structured settlements. 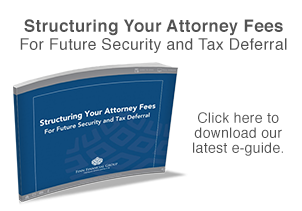 We created a helpful, concise rebuttal in the form of a handy E-Guide to help address several common misperceptions circulating about structured settlements in the post-Great Recession era. We publish a regular newsletter on a variety of specific topics designed to help our clients meet the financial challenges of their personal and professional lives. We share positive information our clients can use on a host of topics relating to our area of expertise. To learn more, contact Finn Financial today.